Mount Adams is perched high above downtown and the Ohio River valley, and is referred to locally as "the Hill." It was originally named Mount Ida, after Ida Martin, a woman who, according to legend, lived in the hollow of an old sycamore tree. In the early 1800s, land in the Mount Adams area was owned by Nicholas Longworth, a lawyer and a businessman who cultivated Catawba grapes there in his vineyard. He was famous for his Golden Wedding champagne. He donated a portion of a southern-facing hill to the Cincinnati Astronomical Society to increase his property value. In 1843, President John Quincy Adams delivered the dedication address for the Observatory, which had at that time the most powerful telescope of its kind. The name Mount Ida was swiftly changed to Mount Adams to honor the president. In 1871 the Observatory was moved to Mt Lookout, and the site became the Holy Cross Monastery, which closed in 1977. The property is now an office complex. The Pilgrimmage of the Holy Cross is a long-standing annual tradition on Good Friday, whereby devout pilgrims climb up the steep hill from Columbia Parkway to the Church of the Immaculate Conception, praying on each step. 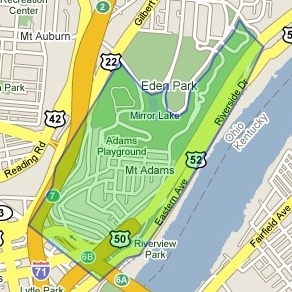 Mount Adams is surrounded by Eden Park on three sides. The park's land was purchased beginning in 1859 and was designated as a water collection area for the city, but the advantage of giving the land a dual purpose by using it as a park was soon recognized. Disease had wiped out Nicholas Longworth's vineyard in the late 1850s, so his son negotiated with the city to allow the use of some of the land for Eden Park (Longworth had lovingly named it after the Garden of Eden). A 172-foot high water tower was completed in 1894. Because of its view of the river valley, Mount Adams played a role in the city's defense against the Confederate Army during the Civil War. Two artillery emplacements were installed, one at Fort View Place, the other at the playground near what is now Playhouse in the Park. Neither gun was ever fired. In the mid-19th century, many German and Irish immigrants settled on Mount Adams, building their homes, which had to conform to the steep topography, from wood and stone quarried nearby. In 1872, the Mount Adams Incline was completed and connected hilltop residents with downtown. The Incline moved passengers, vehicles, and streetcars. This allowed the streetcar to extend its line at the top of the hill, and both the Incline and the streetcar helped to develop the barren hilltops. The ride to the top promised dining, drinks and dancing at the well-known Highland House, located where the Highland Towers now stands. At the time that the Incline closed in 1948, it was considered the city's biggest tourist attraction. The arts also flourished in Mount Adams. Founded in 1881 and completed in 1886 in Eden Park, the Cincinnati Art Museum was the first purpose-built art museum west of the Alleghenies. In 1892, Maria Longworth, the daughter of Nicholas Longworth, moved her Rookwood Pottery factory to Mount Adams. Her pottery is famous for its unique ceramic finish and is a valuable collectible. More recently, Cincinnati's Playhouse in the Park opened in Eden Park in 1960. This regional theater maintains a national as well as a local reputation for excellence. Krohn Conservatory, one of the city's major tourist attractions, opened in Eden Park in 1933. In the 1960s the Hill began to flourish as more downtown workers were attracted to living near their work. Additionally, Mount Adams in the late 60s and early 70s became home to a thriving entertainment scene and was populated by many artists and performers. Its reputation for being "hip" was established.